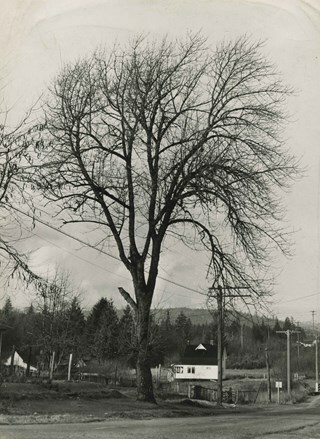 The Buena Vista neighbourhood (so named for its wonderful views) grew out of its proximity to Edmonds and New Westminster and was developed in the period 1911-1912. 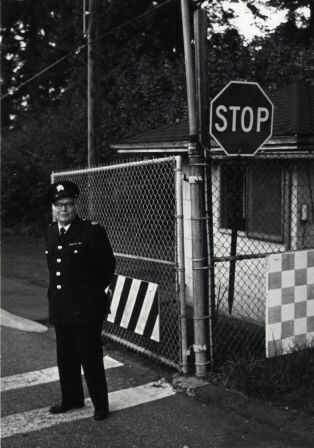 By the 1950s, the area had been further subdivided and in 1986, Burnaby Municipal Council adopted the Cariboo Hills Development Plan for the neighbourhood to maintain its character as a residential area of the city. 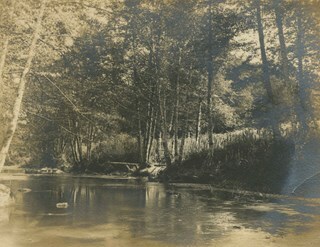 The site for the Armstrong Avenue school was cleared in 1911. 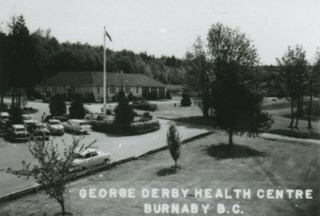 In 1955 the original structure was replaced by a new building and additions were constructed in 1962, 1964, 1967 and 1969. 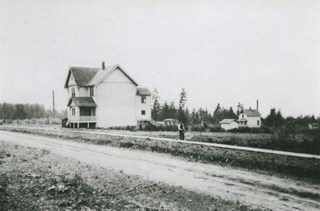 Armstrong Avenue was named after J.C. Armstrong, an early property owner of Burnaby who was involved in the effort to make Burnaby a municipality in 1892. 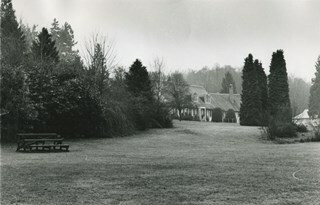 The George Derby Centre was opened in 1947 as a rehabilitation Centre for young disabled veterans returning from the war. The centre was named after George Cleveland Derby, a World War I veteran who was injured in the Battle of Vimy Ridge and later went on to become a District Administrator in the Department of Solders’ Civil Re-establishment, the forerunner of the Department of Veterans Affairs. His work took him to wartime England where he was awarded the Order of the British Empire in 1943 for patriotic and philanthropic work. 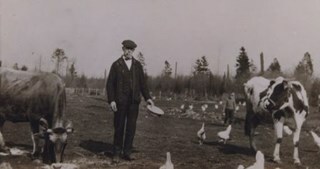 William Holmes is considered to be the first non-Native resident of Burnaby. 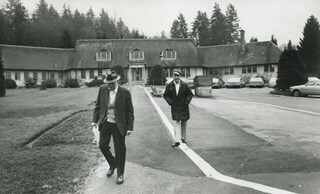 In March, 1860, Holmes acquired the first land title in the area that would become the Municipality of Burnaby. 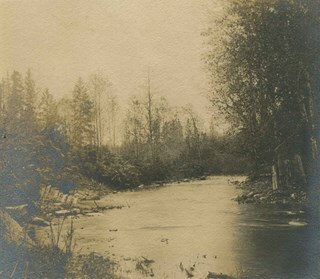 Legally known as Lot One, Block One, this parcel was located on North Road and the Brunette River. The eight-member Holmes family built a log cabin on the lot on a bluff above the river in which they lived for many years until a bigger home was built. 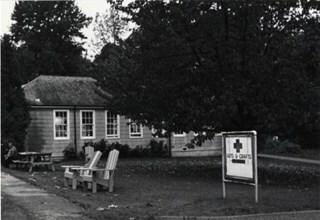 The log cabin remained and in 1892 was used as an isolation hospital when a smallpox epidemic hit the lower mainland. Afterwards, local health officials burned the cabin to prevent the spread of disease. 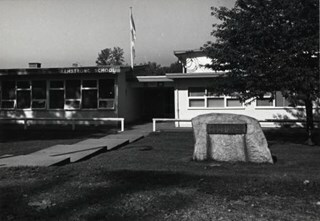 By 1961, three new elementary schools had been built in the northeast section of Burnaby - Armstrong, Seaforth, and Lyndhurst. 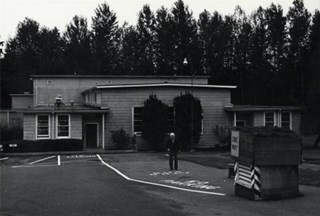 With growing enrolment at each, too many students were required to travel a farther distance to attend Edmonds Junior High School. 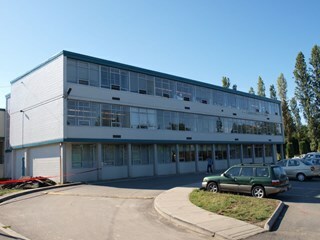 As a result, the Cariboo Hill Secondary School was built in 1961 and opened with 410 students. Its peak enrolment was during the 1974 school year when over 1100 students attended. 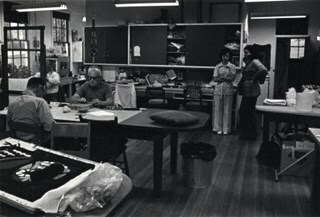 Additions to the school were made in 1969, 1971 and 1974. 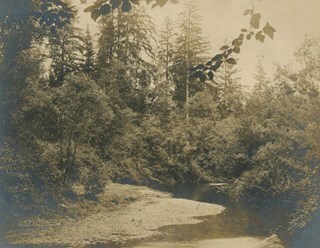 George S. Vickers, a compositor with The British Columbian newspaper, was a prominent Burnaby resident who became involved with real estate during the boom prior to the First World War. In December 1910, The British Columbian reported that “Mr. 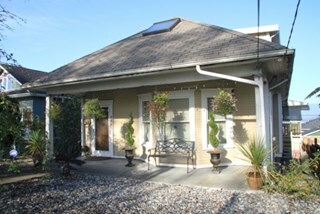 Vickers has commenced to build a commodious residence on Fourth Avenue between 1st and 2nd streets.” This high quality Craftsman style bungalow, completed in 1911, was originally situated on one acre of property, which contained a large kitchen garden, an orchard of 40 trees of various types and houses and runs for chickens, ducks and turkeys. In 1919, the property was advertised for $5,000 and likely sold easily because of its location (three blocks from the electric streetcar line on Sixth Street), its many amenities and property improvements. Some of its selling points included its panelled living and dining room with 3-ply veneer, beamed ceilings and an open fireplace. Craftsman-style features include battered porch piers, unusual double bargeboards, triangular eave brackets and exposed purlins. The house survives in excellent original condition, with only minor alterations. This modest, hipped roof, cottage-style bungalow is distinguished by a full width front verandah. It was built as part of the Buena Vista subdivision in about 1911 by the Leibly & Blumer Real Estate Company. It was reported in The British Columbian in 1911: “Ten houses are now being erected by the company on the property, solid substantial five or six-room buildings that appeals to the homeseeker”. Retaining a high degree of integrity, this residence displays its original double-hung windows and lapped wooden siding. Houses of this type were often constructed from a complete package of materials offered by building supply companies, and were extremely popular due to their low cost and ease of construction. 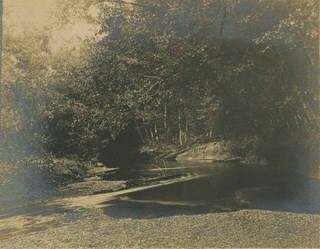 Photograph of the Brunette River. 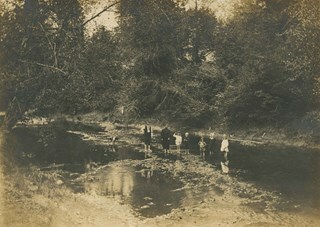 Photograph of a man, a woman, five children, and a dog wading in the Brunette River. 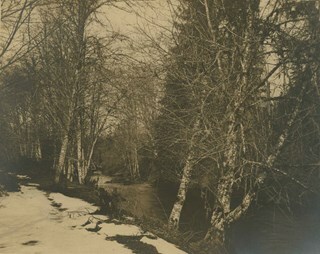 Photograph of the Brunette River in the winter. 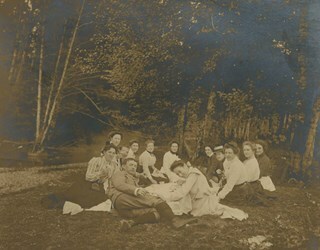 Stamped on back of photograph: "Rotograph D."
Photograph of a group of men and women at a picnic near the Brunette River. 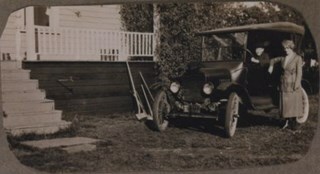 Photograph of a woman standing on the front porch of a house with a log fence with a gateway in the centre. According to the accession register, the location of the house is at Buena Vista, Burnaby, between 1912 and 1925. Photograph of a woman with short dark hair wearing a white blouse, sitting on the steps of a house. According to the accession register, the location of the house is at Buena Vista, Burnaby, between 1912 and 1925. Photograph of the exterior of Armstrong Avenue School in the snow. A car is parked outside. Aerial photograph of Burnaby and Coquitlam with North Road running through the centre. Aerial photograph of East Burnaby up to North Road and south of the Trans Canada Highway. Aerial photograph of East Burnaby and Coquitlam with North Road running through the centre. 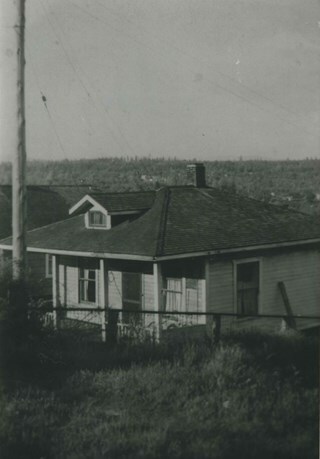 Photograph of the Klub family home at 562 Craig Avenue (old street numbering system) looking north toward Coquitlam. Photograph of the side elevation of Armstrong Avenue School. A man is visible walking along the sidewalk, near the school. Photograph of the front of Armstrong Avenue School. 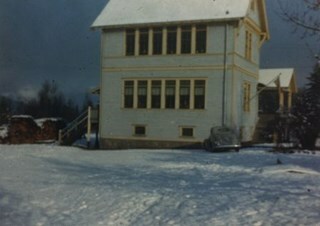 Photograph of Cariboo Hill Secondary School. 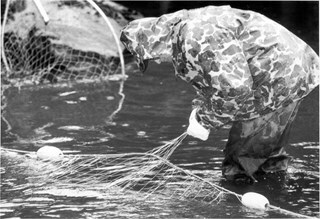 Photograph of a Elmer Rudolph of the Sapperton Fish and Game club fishing for coho. 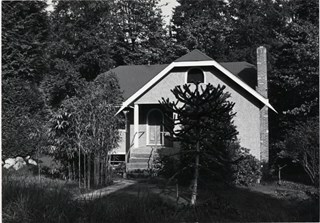 Note in black ink on recto of photograph reads: "3954A Bby Brian"
Photograph shows a house at 9113 Mona Avenue, built in 1952. 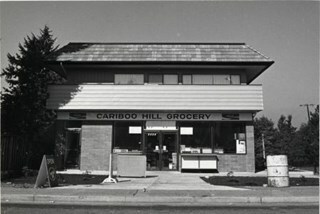 Photograph shows Cariboo Hill Grocery on Armstrong Avenue. Photograph shows Armstrong Avenue Elementary School at 8757 Armstrong Avenue. Photograph of a house with a large porch and a log fence with a gateway in the centre. 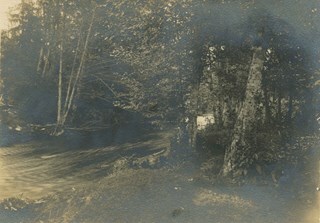 There is a cobblestone pathway, and two women and a man, standing on the porch. 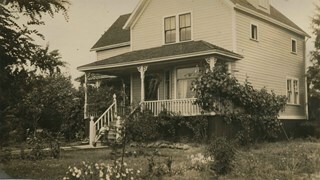 According to the accession register, the location of the house is at Buena Vista, Burnaby, between 1912 and 1925. 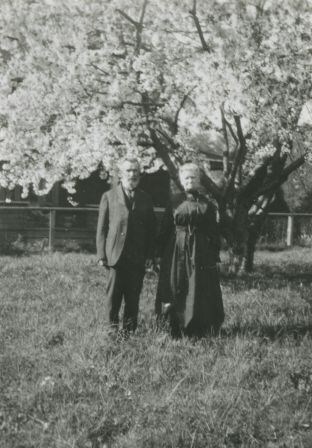 Photograph of two middle aged women in a garden standing by rose bushes. They are wearing light coloured blouses with long skirts. One of them is wearing a hat. There appears to be a patio or a gazebo in the back behind the women. 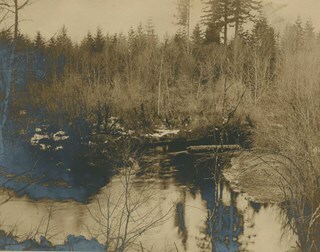 According to the accession register, the location is at Buena Vista, Burnaby, between 1912 and 1925. Photograph of a house with a large porch area. The house looks like it was renovated with a window put in on the second floor, The stairs, patio and the lawn in front are covered in snow. According to the accession register, the location of the house is at Buena Vista, Burnaby, between 1912 and 1925. 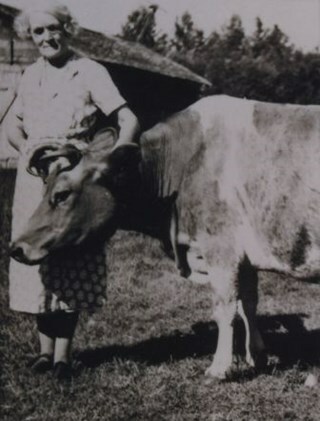 Photograph of a middle aged woman standing in front of a house. She is wearing a shirt with flower emboridering at the bottom left hand corner with a long pleated skirt, and a hat. 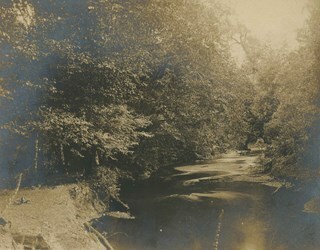 The annotation on the back of the photograph identifies her as "Emily." 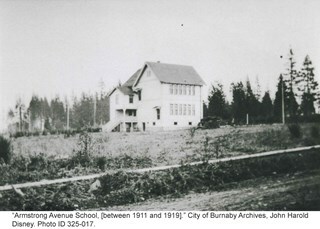 According to the accession register, the location of the house is at Buena Vista, Burnaby, between 1912 and 1925. Stamped on the back of the photograph: "Better Pictures / NuGloss / Photo Finish / Vancouver Drug Co."